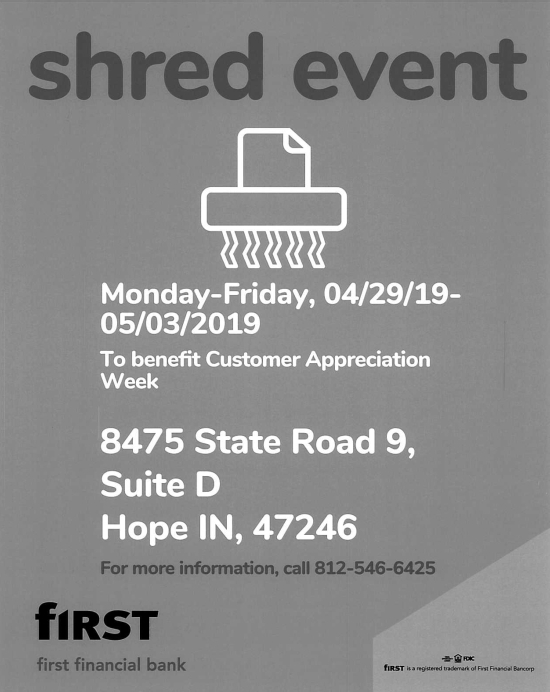 First Financial Bank in Hope will be holding a document shredding event as part of its Customer Appreciation Week, from Monday April 29th through Friday, May 3rd. The First Financial Bank branch is at 8475 State Road 9, Suite D in Hope. For more information you can call 812-546-6425. Dining with Diabetes is a 4 week series for those who want to know how to better take care of their health. Diabetes is a chronic disease that can be controlled. Topics covered include: planning meals and snacks with delicious and healthy recipes,reading food labels, using a variety of sweeteners, using seasoning to replace salt, the role of fiber in the diet, the difference between various types of fat, ideas for being more active, and setting personal goals to manage your diabetes. Recipes will be prepared and served, and informational binders shared. The class will meet at two different locations at two different times on the same days- (Mondays) Jan. 28, & Feb. 4, 11, 18, 2019; 1:30-3:30 pm - Mill Race Center or 6-8 pm - Barth. Co. Public Library. The cost is $20 per person for all four classes or $30 for a family of two which share one binder. Partial scholarships are available upon request. Registration for Mill Race is to be done by calling 812.376.9241 and registration for the Barth. Co. Public Library is to be done by calling 812.379.1665. The program will be conducted by Harriet Armstrong, Health & Human Sciences Educator, Bartholomew County.